Offers: Various special promotions, contact club for detail of prevailing offers. Modern clubhouse with changing rooms, bars, restaurants, lounges, leisure facilities, accommodation and pro shop. Golf facilities include practice areas, driving range and equipment hire. 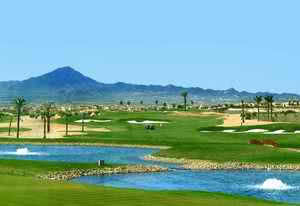 Hacienda del Alamo, designed by Dave Thomas, is a chapionship length, par 72 golf course set in the Murcia region of Spain. The Dave Thomas design maximised the opportunity provided by the natural rolling landscape and added extra interest and challenge with extensive planting of palm trees and by bringing the eight lakes into play on a number of holes. Always well maintained and offering a challenge to even the most accomplished of golfers, Hacienda del Alamo is worth making the effort to play.